A mother-of-three nearly died after developing an infection that killed the tissue in her left breast. Vicky Doxat, now 38, dismissed her flu-like symptoms as mastitis – painful, inflamed breasts – while feeding her newborn twins in 2016. But her left breast soon turned ‘scarlet’, with the pain becoming unbearable. Despite the agony, she was sent home from hospital, with doctors reassuring her the bruising was due to where she expressed milk. Just days later, Mrs Doxat, of Petersfield, was unable to speak, had a black breast and felt so ill she ‘wished she was dead’. She was finally diagnosed with necrotising mastitis – one of just six known cases worldwide. 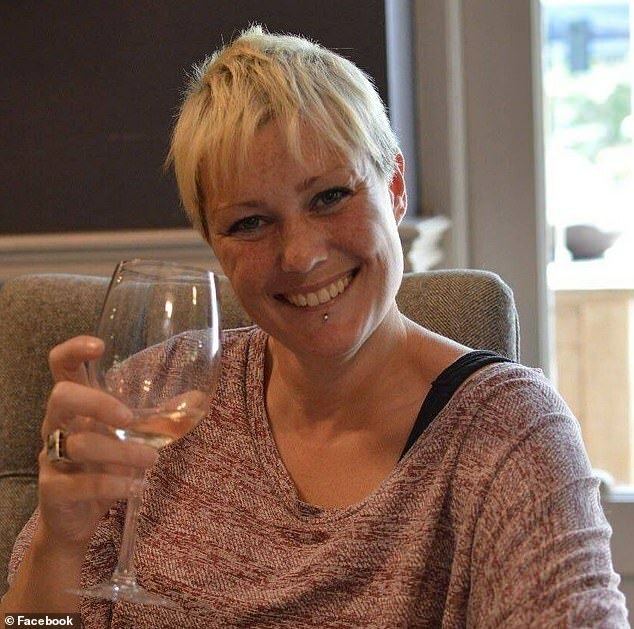 After surgery to remove her left breast – and many more to reconstruct it – Mrs Doxat has recovered well. Mrs Doxat had experienced painful breasts before while feeding her older son and assumed a short course of antibiotics would sort it out. 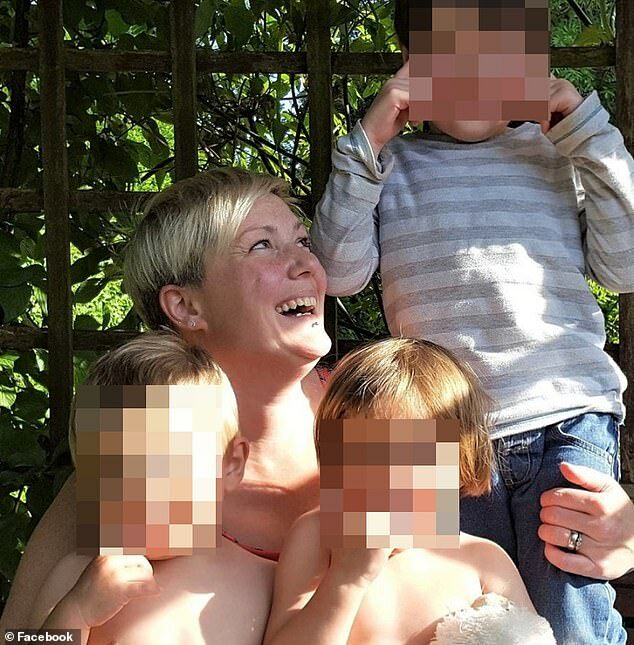 Although she still managed to breastfeed her twins, the pain got worse overnight, with the antibiotics she had been prescribed doing nothing to help. ‘The pain from my left breast was now unbearable – my breast was not only swollen and sore but had turned scarlet,’ she told The Mirror. After going to hospital, Mrs Doxat was told to let the antibiotics run their course and was sent home with stronger painkillers, despite the beginning of a black bruise. ‘Everyone assumed I had caused the bruising when I had tried to express milk and there was no undue concern at this point,’ she said. Things took a turn for the worse the next morning when her left breast was twice its normal size and the bruising had spread. Barely able to speak or stay awake, Mrs Doxat was rushed to hospital, where she was immediately put on a IV drip. By this point her left breast was completely black, which prompted doctors to incorrectly diagnose her with the flesh-eating bacteria necrotising fasciitis. Necrotising mastitis is a flesh-eating soft tissue infection that affects the breasts. It can lead to gangrene, loss of skin or even death if untreated. Necrotising mastitis is rare, with reports suggesting there are just six known cases worldwide. Treatment is usually IV antibiotics to treat the infection and surgery to remove the dead tissue. Patients then undergo a skin graft and breast reconstruction. Mrs Doxat was confined to a cordoned-off private room, with only her husband and mother being allowed to visit. Despite receiving medical attention, her infection spread until her entire abdomen was red and she needed morphine to cope with the pain. ‘It was pretty much touch and go at this point I think,’ she said. To reduce the risk of further infection, Mrs Doxat was forced to take a hormone that would stop her lactating before she could be operated on. This combined with being separated from her children caused her to spiral into a deep depression. Thankfully, the surgery was a success, with Mrs Doxat spending two weeks in intensive care recovering. A month after first arriving at hospital, she was finally able to home, but was still in too much pain to pick up her children. Years on, Mrs Doxat feels the reconstruction surgery has left her looking as good as before, with the ordeal also encouraging her to look after her health. She is speaking out to encourage mothers to look after themselves and also take up offers of help.